APPLICATION DEADLINE IS SUNDAY APRIL 1st, 2018. Would you like to have an international experience while at CofC? 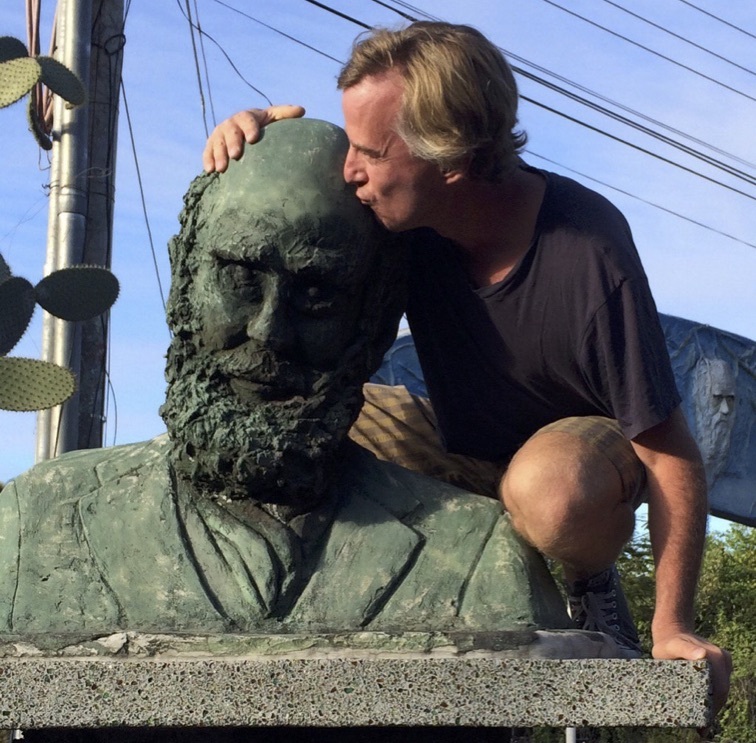 Want to take Biology and Environmental Studies classes while immersing yourself in a foreign culture? Are you ready for a semester-abroad in Spain in Fall 2018? (see YouTube video here, CofC Trujillo Facebook page here and CofC Today article on Trujillo here). Click here for brochure. The College of Charleston offers semester-long programs abroad at its Trujillo campus in Spain, but it is rare that these include Biology courses. 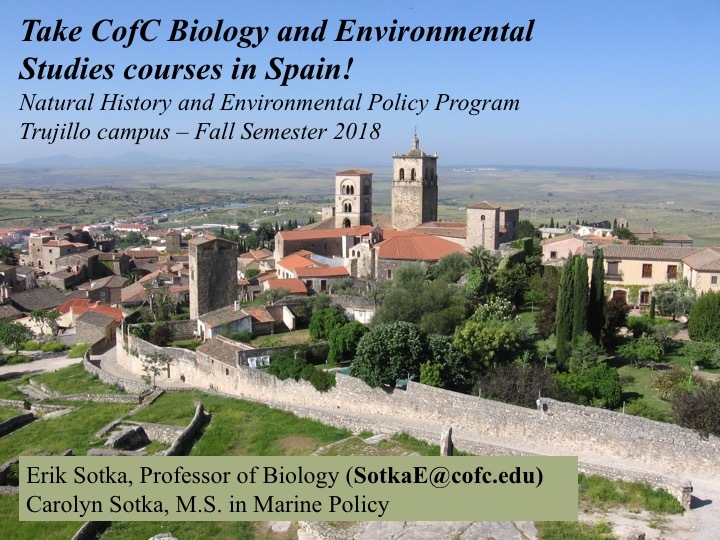 For Fall 2018, we are offering a program entitled “Natural History, Environmental Sustainability and Policy: An Immersive Experience in Trujillo Spain“. Students are immersed in Spanish language and culture through living with experienced host families. The town of Trujillo, under consideration for UNESCO World Heritage status, is embedded within a fantastic diversity of geological settings and Mediterranean ecosystems. The area surrounding Trujillo is one of the best birding locations on the planet, and harbors critically endangered species such as the imperial eagle, hispanic mountain goat, black stork, black vulture and the black-wing kite. Multi-day field trips will allow students to compare the coastal ecology of the Mediterranean and North Atlantic, go whale watching, and witness marine conservation and aquaculture in action. There will also be opportunities to travel thru Spain or other European destinations on your own. This semester-long program integrates Biology and Environmental Studies classes in a hands-on, field-oriented curriculum with enthusiastic faculty. The major goal is to compare and contrast sustainability efforts at local, regional and global scales, focusing on topics such as threatented species protection, ecotourism, and production and extraction of food, energy and other products in Spain. 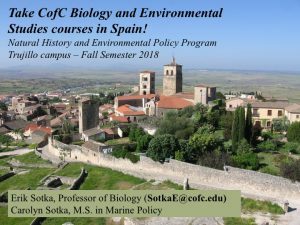 Courses will be taught in English by two CofC faculty (Dr. Erik Sotka, Professor of Biology; Carolyn Sotka, MS in Marine Policy and adjunct Professor of Biology). A Conversational Spanish course is led by a professor from the Universidad de Caceres. We designed the program to allow student advancement toward graduation for Biology majors, Environmental Studies minors or both. The program may also be of interest to any major in the School of Sciences and Mathematics. Tentative Dates Trujillo 2018: Depart First Week Sept – Return Mid Dec 2018. Students must enroll for the full 13 credits to participate. Room and Board for the entire semester, staying with experienced host families from Trujillo. All Field trips, including a 4-5 day trip to Galicia and 4-5 day trip to Andalucia, and weekly day-long field trips. All hotel accommodations and 2 meals a day are included during these trips. *Tuition is NOT included in this fee. Students will pay their normal CofC tuition. All financial aid and scholarships that students normally receive will apply. We strongly encourage you to check out pictures and video testimonials from students at the CofC Trujillo Facebook page (click here), past Fall Trujillo programs (click here) and videos of the Fall 2012 Biology program (here). Stephanie Leahy (leahys@cofc.edu) from the Office of International Studies has information on scholarships and financial aid for the program. Study abroad scholarship applications are encouraged (Click here for more information). The registration deadline is ASAP! Please approach us with any questions you or your parents might have regarding the Trujillo Fall 2018 program. For Biology specific questions contact Dr. Erik Sotka (SotkaE@cofc.edu) or Carolyn Sotka (SotkaCM@cofc.edu). Those with questions regarding the Environmental Studies minor, please contact Dr. Allison Welch (WelchA@cofc.edu). 25 August 2015 – Dedicated undergrads present summer research. Meeting Seeds-to-Shoreline teachers: citizen science!